Ripped Recipes - Maple Pumpkin Pie Protein Bites! 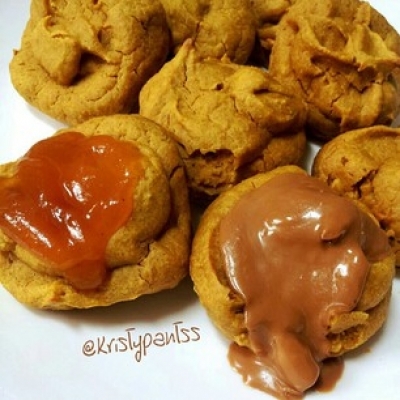 Home » Recipes » Snack » Maple Pumpkin Pie Protein Bites! Maple Pumpkin Pie Protein Bites! These Babies are moist and satisfying, more reminiscent of pumpkin pie than a "bready" pumpkin muffin. Super easy to whip up, too! For the muffins: 1 cup pumpkin puree, 1 cup oat flour, 1 egg, 1T maple extract, 1/4 cup vanilla whey, 1/3 cup coconut oil, 1t unsweetened almond milk, 1/2 t baking powder, 2t pumpkin pie spice. Combine all ingredients well, first the wet, then add in dry. Bake at 175 C for about 15-18 minutes. Top with anything you choose, or enjoy plain. Toppings in photo are maple pumpkin butter, and cookie butter.